Gordons Direct Blogger Of The Month – Real Techniques Make-up brushes. I’ve never, ever blogged about make-up brushes before because I think I’ve actually bought about three in my life. My brush collection I have to admit comes almost exclusively from the brushes bought with gift sets or palettes. I do buy a flat foundation brush and use that every day. Other than that I have to admit not an awful lot of thought goes into them. Things are changing though as Gordons Chemists have sent me this lovely little set of Real Techniques brushes. 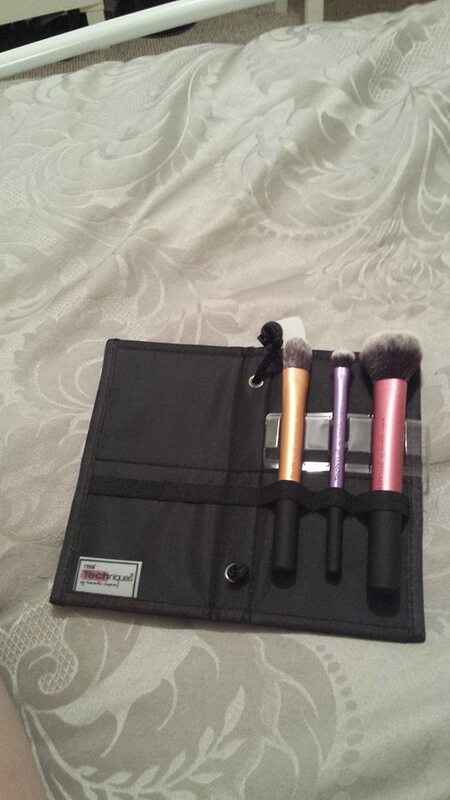 It’s a travel set but it does have everything you need if you’re just starting out; a multi-purpose powder brush, a flat foundation brush and a domed eyeshadow brush. AND the whole lot is wrapped up in a nifty carry case. First things first, these things look AWESOME. Each one is a different colour of brushed steel with a rubber end to help with grip. They’re bright so they’re easy to find in the depths of your make up bag and easy to handle. Like I said I don’t know an awful lot about brushes but these seem gorgeously soft AND they maintain their softness over time. My absolute favourite though is the domed shadow brush that I forgot to take a picture of. It’s swiftly become my favourite eyeshadow brush, particularly when it comes to blending as it creates the most perfect, smudgly look. I don’t think you can buy this brush on its own but handily enough the entire Real Techniques Travel Essentials Set is on offer at Gordons Chemists right now for just £10 – it was £20.99. You can find it here and there are loads of other Real Techniques brushes on offer too.